Can Appraisals Affect The Selling Price On A House? Why Is The House Not Selling? When you want to make your investment(s) in Real Estate. Hi there, 10to8 received a satisfaction survey result from Stephen C. Here is what they said: How satisfied were you with our service (out of 5): 5 How likely are you to recommend us to a friend (out of 5): 5 Any additional comments: Luke helps me think in a different way about Real Estate that frees my mind and let's me concentrate on what is important. I appreciate this company. We purchased a Turnkey Cash Flowing house from Sol Mar and also loaned them money for a renovation opportunity and we are very pleased with both transactions. They are very knowledgeable about real estate transactions, good at customer service and very professional. We highly recommend them for any investor looking for secure predictable returns on their idle cash or IRA. Good company! John C. - Memphis, TN. As a real estate investment company, we treasure relationships like the one we have with Sol Mar REI. We purchased properties from them and all the transactions went smooth. I am confident we will do many more with them as they understand our business model and deliver. I highly recommend their company to any investor. Sol Mar REI is professional, knowledgeable and service oriented. Richard B.- Texas. 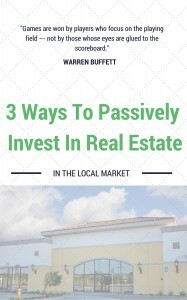 We are a real estate solutions and investment company that specializes finding value added real estate opportunities,executing on those opportunities to revitalize our communities, create thriving income properties, and to partner with qualified investors to help them participate in this real estate market. This is not a solicitation or offer of securities. Investment is offered only to qualified investors through a written Investment Agreement or Private Placement Memorandum.